On 30 October 1899 the fishing boat Emeline left Lowestoft to return home to Mousehole. She never arrived. What happened to her? A similar lugger was seen off Dover on 1 November, deep in the water and drifting towards the French coast, and a Penzance fishing boat sail washed up on the beach at Folkestone may have been from the Emeline. Hope faded as the days passed, and the Emeline was assumed lost at sea – perhaps run down by one of the new-fangled steam boats. The Emeline, PZ 392, a first class lugger 53.8 foot long and weighing 26½ tons, belonged first to Richard Bath of Newlyn (born c. 1843), who owned her from 1893 to 1897. He probably named her for his daughter, who was baptized Emily Richards Bath in 1868. Perhaps she adopted the name Emeline (or Emmeline) informally at first; she was still Emily in the 1891 census, but by the time of her marriage to George Stephen Cara in 1892 she was recorded as Emmeline Richards Bath, and in the 1911 census and on her death certificate (1933) she is Emeline. 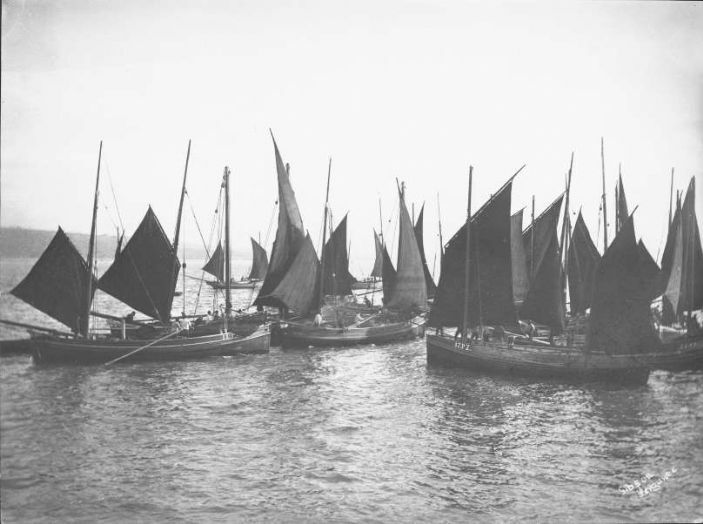 In 1897 Richard Bath sold the lugger Emeline to another Mousehole fisherman, Abraham Madron. At the time of the tragedy the master was Abraham Madron’s son, another Abraham Madron. Many Mousehole fishermen regularly took their sailing luggers long distances to fish for herring in Ireland or the North Sea off Scotland. The Emeline had been fishing for herring in the North Sea. When the other boats in the Mousehole fleet returned home, Abraham Madron junior decided to send for his nets and gear and remain at Lowestoft to fish for mackerel with the Lowestoft fleet. Two members of his crew were unwilling to stay and returned home, so local men were temporarily engaged to replace them. When the Emeline set out for home on 30 October she was therefore two men short. There were four men and a lad on board: the master Abraham Madron junior, John Pollard and his 16-year-old brother Charley, Ben Harvey and Richard Polgrean. Their loss left two widows and four fatherless children. The owner of the boat lost not only a son, but also his life’s savings, property worth £546, only £135 of which could be recovered from insurance. The Mount’s Bay Fishing Disaster Relief Fund was closed and its funds of £68.5s were transferred to the newly formed Emeline Disaster Fund. An appeal for further funds to help the bereaved received donations ranging from 1s to 40s. Buttery, Mike ‘Butts’ - Ledger of Penzance fishing boats, electronic copy held in the Newlyn Archive. The Cornishman, 26 October, 16 November and 7 and 14 December 1899.